I finished Lyn's autumn block this week. It'll be in the mail tomorrow. This is the way I received it, and after me there's only one more person to work on it. 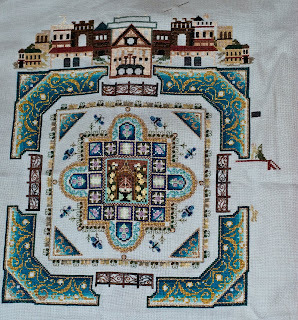 And I have only one more block in the round robin to work on, too! Here is the block after my work. I added some of the motifs from Bulgaria, a vine on the side, and two seams - one gold one at the top to balance the gold on bottom, and then beads across the top of the orange. I know Lyn adores Cobi's work (so do I, she does awesome things), so I left the central area blank for Cobi to play with. I hope Lyn likes my additions. 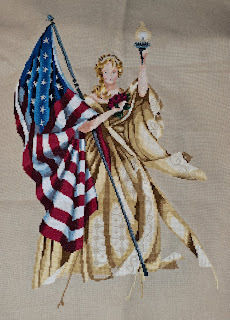 I finished the last of the skirt under the flag this week and worked more on the flounce. It's kind of nice being able to tick off areas as done. This week, I started on part two of the Kaleidoscope. 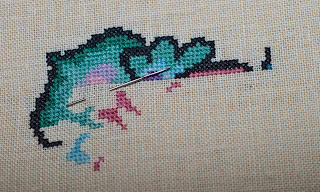 I'm getting more colors, and at the end of this part there's going to be a lot more stitching on this piece done. 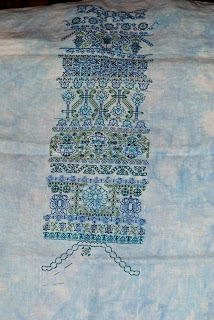 I'm doing it as a stitchalong with the German language Marquoir group on Yahoo.de. I'd like to thank the moderators and Tracy Horner for allowing us to do this! 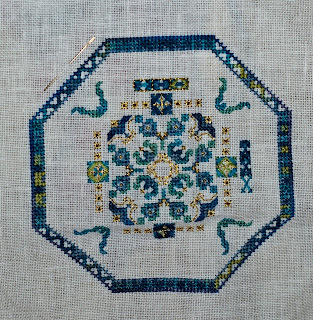 I'm beginning to get the huge middle part done - the outer circle shows itself curving down this week. I'll probably get the W and E done over the next week. Yay! This week I did a bit of the foot and some more of the front tire. I'm at the anxious point where I can tell it's nearly done, but it's not close enough to get done in a day or so- which is my criterion for sitting and just finishing something. 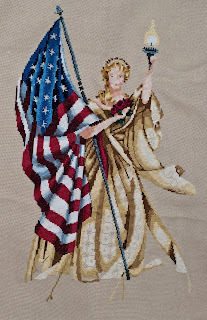 I was working on this at picture time, so it' s only partially through the weekly two needles-ful of floss. I'm still in love with the Tentakulum colors, and like the fabric too, even though I have to take my glasses off to work on it. Yep, I got the eighth part of Zentangle done this week. It's got either two or three parts to go. I have the ninth part in my possession, but I won't work on it until I have part two of the Kaleidoscope Mandala done. I added some green shoots this week to the band, and started with the insides of the main ladder. The picture's even a bit straighter this time. Hopefully next week I'll have more fleshing out done. Yay! I'm caught up with this again. The next part doesn't come out until August first, so I can put it aside for the next week and a bit and know I won't get behind on it. A couple of colors make their first appearance in this, too. 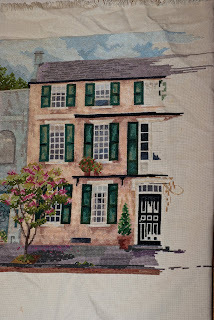 This week I finished the twin to the brown house I completed a few weeks ago. Things are moving to the top somewhat quickly now, and I even managed to do a bit more on the side town scene. I not only did some window this week, I did a bit of the building around the door. 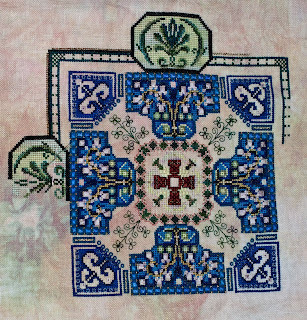 It's all whole cross stitches and worked over a big surface, so it feels kind of like doing a HAED design. If I haven't miscounted, I've got the top all the way across now. Just need to fill in the rest of the top strip and then the fun part - starting the different designs on the four sides. Some rice stitches started this week - The four large stitches and then the bars of stitches at the top and side. They look like a lot of progress, even though they're very few stitches, because they're huge. Both the egg and the connector are coming along fairly well. All of the inner line of the connector is done, and I will be adding the black this coming week. The egg's insides is no longer looking like swirls, but real palm leaf flourishes. Maybe I'll be able to start the third egg soon. Things look a bit crooked, but it's only the picture. Everything's even. The ladder's the central part of this band, and there are flowers all around it. I'm really hoping to finish this piece relatively soon. I started my See the Stars for July last week. 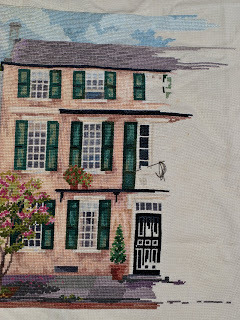 It's got a -lot- of stitching this month, so I was no where near finishing it by the end of the week. It's looking good, though. I really love these colors. I worked on two areas on the top houses this week - the far upper house on the right is done but for the roof, and the central building has everything below the roof areas done. Not a single strand of brown, even. Yay! The flounce is getting more of the dark part, and I extended the darker area on the skirt near it too. Lastly, I got the darker area/puddle, swag, whatever it is outlined on the second of the light panels. ... than vertical progress. Still doing a lot on these long lines. After this part, I should be picking up speed again, since this is the widest area of the whole design. A couple of windowpanes done this week. It's my official UFO project at the moment, since it's the oldest thing I'm working on. It feels good to be making progress on it again. The tires are getting round now, and the piece is getting closer to its completion! I'll have it done, perhaps, by the end of the summer. Still stitching away on everything. I added the bottom part of the top band to the left. We couldn't get the color quite right on the photo this time for some reason. The seventh part is done now. I have yet to start part eight, as I've been working on See the Stars. It's on my list to do as soon as that is done. I'm still two parts behind. I'm getting this done, starting the second of three parts. It has some cross stitches, but a lot more rice stitches. The end is in sight. This was the final block for me to work on from the Anything Goes Traditional round robin. Wendy just had a color theme, but as you can see, the block was pretty full of fans and such when I got it. The top right and bottom left were rather naked when I got it, so that's what I filled. She's already got it home now, too. I have one block at home yet to do unless some have arrived in the mail in the past few days. I don't know because I've been on a trip. I get home on Tuesday evening. I made progress on both the line and the egg this week. The line's got its bottom blue edge and the egg's got more acanthus leaf done. I'm almost halfway done with the egg. I've gotten the outline of the middle element done; now it's time to get everything else around it started. With this part complete, though, I shouldn't have to worry about having things out of place by much - I hope. One last brown week, it seems. I did a lot of brown next to the completed house and got most of the other brown houses done. it seems several houses will finish quickly and together - hopefully somewhat soon. Remember I made a tin for a tin swap last month? Well... Cindi drew my name to send one to, and she made a beautiful one! This is it, in four pictures. Thank you so much, Cindi! I love it. She also put some goodies inside. I don't tat, so the tatted things are such a beautiful mystery to me. I'm sure I'll find a use for them. Thank you for the motifs and threads and beads and thread holder! I had to do some frogging this week, right at the bottom. The darker patch that was there was off by one row, so it -all- had to get ripped out. On the other hand, I got some work on the flounce on the side done and lots of white-ish panel done. I'm still not flagging in my effort to complete it. A week ago, my Mattie the Sharrvelous had hip surgery. 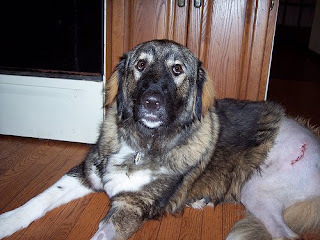 She had what is called an FHO because she had severe hip dysplasia. As you can see, they made her ugly for a bit! She looks really funny with all that area hairless. It's even more starkly disconcerting in person. 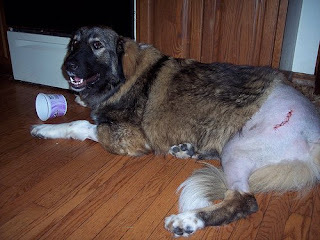 Mattie's healing well and is putting a little weight on her leg. Hopefully, she'll be terrorizing deer again soon. This week I started another project with the Marquoir group. They started it about two months ago, but I wanted to get caught up, or at least finish the Spring Mystery, before starting more. 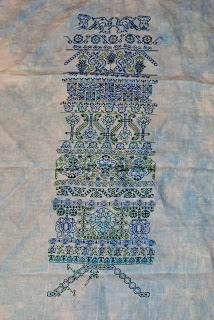 This is the first part of Kaleidoscope Mandala from Ink Circles. Tracy Horner, the designer and owner of Ink Circles, graciously allowed us access to it. I'm doing it in the original colors but in Vikki Clayton's silks. Because there were looooong lines this week, it doesn't look like much progress. There were as many stitches as usual. They just didn't result in more than a line or two of progress down the pattern. I filled in a pane and a half on the window above the door this week. Not bad progress. 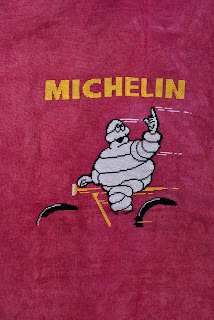 Bibendum's bike and leg both got some work this past week. 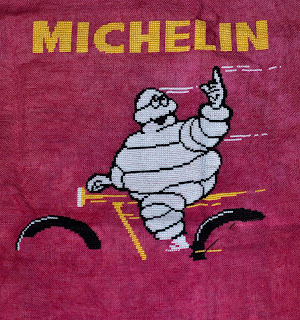 His bike, outside of the tires, is done, and his leg's got just the foot to add. I'm getting close to completion. On the left, you can see how the top band of the bag is going to look. I'm at about the two-thirds point on the top color's extension. 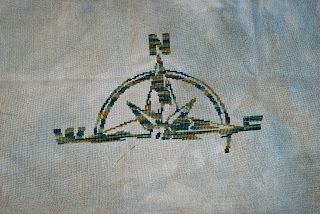 I really like the thread, but for some reason, this is harder for me to stitch than other things. 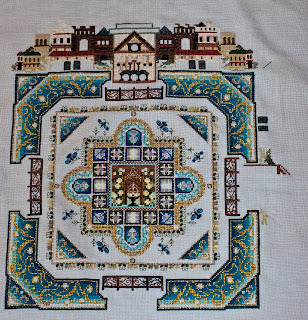 I added rice stitches along the border this week. 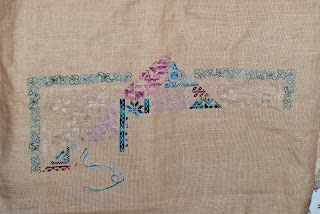 There is supposed to be a marked difference between the one strand and two strand rice stitches, but it's less noticeable that the directions imply. Anyway, the major part of the piece is done. Now I'm gliding down the back half. I got some of the acanthus formed on the second egg and all the dark green on the second line, since the first one is done. Things are coming along nicely, and it was the last of the stuff that got two rounds of work this week. You can really tell the difference between just two and four needles-ful of floss. I added more to the top border of band ten. It still looks like Space Invaders to me. I'm sure that wasn't the intent in the seventeenth century. Maybe the video game designers got the idea from blackwork? The house just left of the middle building is done! Yay, it's the first on the upper level of that side done. I also cleared out a lot more brown in the side - to the point where I don't have all that much more brown to do. I'll be glad of the brown break. I finished another of the cream panels in the skirt this week and did some darker brown on the side. The flounce on the right is started, too. She got worked on twice, so it's pretty easy to see the extra work versus two weeks ago.